The last month or so has been a blur, with not enough time to get everything done, and paying attention to Observations and visiting my regular sites has really taken a hit. I hope that will change before long. This past weekend provided some down time to do some catching up, but the place we stayed didn’t have Internet access in the rooms, and that really was a bummer. With that introduction, what happened was that last Thursday, Diane and I packed up the car and headed for Music City, USA, Nashville, Tennessee. 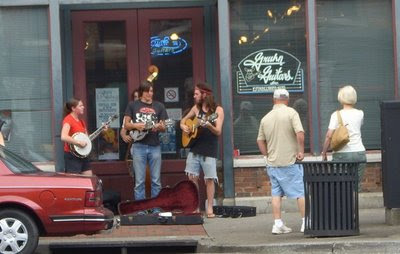 I’ve been to Tennessee a few times and enjoyed it each time, but have never been to Nashville. The reason we went: three-fold. First, our anniversary is Tuesday and we wanted to do something to celebrate. Second, we both have friends there, and third, since we’ve never been there before and it’s a destination attracting millions a year, we thought it would be a good trip. We weren’t mistaken. At the outset I should say that this trip was about friends and music more than about finding good food, although we did have some good food. On Thursday evening after our arrival, my friend Jim and his wife Tammy picked us up and took us F. Scott’s, a nightclub/restaurant to get a bite and hear some of the local musical talent. We sat in the bar area where a great trio entertained us. The food and the music were both very good. After that, they drove us around the downtown area around Broadway and showed us the high points. Friday at lunch we met Diane’s high school buddy Carla at Cracker Barrel, and that was good, too, and after wandering around a little went west to experience a place called the Loveless Café to meet two former students at the college Diane works who got married and work in Nashville, Jess and Aaron. Without going into the complex historic background of this storied place, suffice it to say that this motel/diner-turned-world-famous eatery was great. A home-style restaurant with “the world’s best biscuits,” Loveless was a terrific place to eat and renew old acquaintances. After that, we dropped into a jazz club to hear Don, a guy I met a year or so back, play with a jazz quintet. 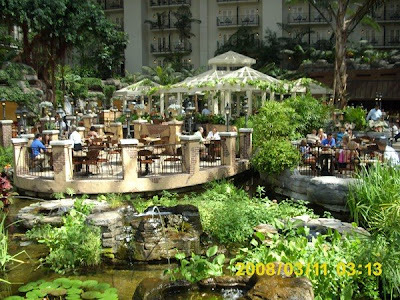 We visited the Opryland Hotel Saturday afternoon with a high school friend of mine I hadn’t seen for more than 30 years. It was good to see Mary Lee after all these years, and the hotel is spectacular. I recommend it highly. That night, we took the dinner cruise on the General Jackson riverboat and we were pleasantly surprised at the high quality of both the food and the entertainment. 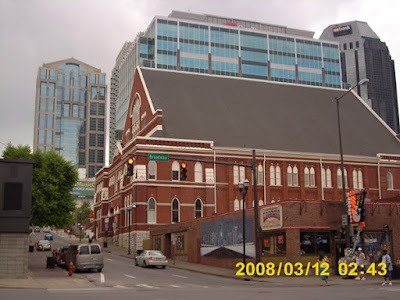 In the downtown area we visited BB King’s blues club, Ernest Tubb’s Record Shop, the Ryman Auditorium, and the Hard Rock Café to buy daughter Kat a tee shirt, and a few other places. On Sunday afternoon when we went to a place called the Caney Fork Fish Camp for lunch. Diane isn’t much of a seafood fan so she had the ribs, which were served in the most unique way: in a skillet. I don’t mean a typical restaurant skillet that they serve sizzling steaks or fajitas on, I mean an honest to Pete 12-inch frying pan. The ribs were terrific, and my Crab Cake Po Boy was, too. For me, musically, the high point was the Nashville Jazz Orchestra, a group of fine musicians led by my friend Jim, that played Sunday from 4 to 6. Nashville may be best known for country music, but there are some truly great jazz players there. The nineteen-piece big band was flawless and fantastic, and their singer Annie was a delight. All in all, it was a good trip, and we’ll do it again sometime.